Agostino Fossati (1839-1904). Born in La Spezia in 1830 to Giuseppe Fossati and Clorinda Bettinotti. He is admitted to the School of Ornate Spezia October 10, 1845, up from being called to teach in the same school at the end of the studies, in 1853. In 1855 he is professor of Geometry Linear applied to the arts. In 1860 he was commissioned by the City Council to paint the reading room of the casino Civic. In 1869 he exhibited two paintings at the Promoter of Genoa and again, in 1871, three works. 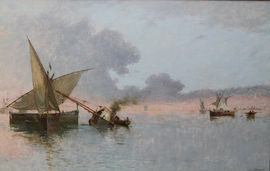 In 1878 at the Turin Promotrice exposes the painting Along Sea (Marina). In 1880 the Promoters of Genoa and Turin exposes other paintings, including Shipyard Faggioni- Via San Bartolomeo in Spezia (Genoa) and Entry Team in the Gulf of Spezia after maneuvers. In 1882 he was appointed member of the supervisory board of the Museum of La Spezia and is elected member of the Committee of Ornate. In 1887 participates and is rewarded with a gold medal at the Penitentiary of La Spezia. In 1889 is again present at the Promoter of Genoa and in 1890 at the Promoter of Turin. In 1892 he exhibited eight works at the Promoter of Genoa, during a holiday inColombia. In 1894 it is recorded as a Professor of Ornamental design at the Royal School of Arts and Crafts. In 1896 is still present at the Promoter of Genoa with four works. He died December 7, 1904 in his hometown.